HARRISBURG (AP) — Two eastern Pennsylvania kennel operators shot 80 dogs after wardens ordered some of the animals examined by veterinarians, dog law enforcement officials said Tuesday. 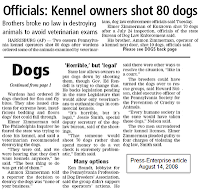 Elmer Zimmerman of Kutztown shot 70 dogs after a July 24 inspection, officials of the state Bureau of Dog Law Enforcement said. His brother, Ammon Zimmerman, operator of a kennel next door, shot 10 dogs, officials said. State law allows owners to put dogs down by shooting them, though Gov. Ed Rendell is trying to change that. He backs legislation pending in the state Legislature that would allow only veterinarians to euthanize dogs in commercial kennels. “It’s horrible, but it’s legal,” Jessie Smith, special deputy secretary of the doglaw bureau, said of the shootings. “That someone would shoot 70 dogs rather than spend money to do a vet check is extremely problematic,” Smith said. Many options Ken Brandt, lobbyist for the Pennsylvania Professional Dog Breeders’ Association, said the group didn’t support the operators’ actions. He said there were other ways to resolve the situation, “like in a court.” The breeders could have turned the dogs over to rescue groups, said Howard Nelson, chief executive officer of the Pennsylvania Society for the Prevention of Cruelty to Animals. “Every humane society in the state would have taken those dogs,” Nelson said. The two men surrendered their kennel licenses. Elmer Zimmerman pleaded guilty to four charges of violating the dog law, Smith said.